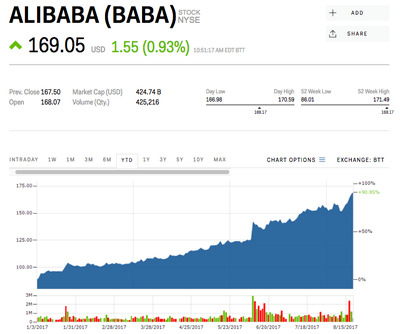 Markets InsiderAlibaba has been on fire this year, surging more than 90%. While Alibaba is certainly feeling the love from many areas of the investment landscape, it’s still the most shorted company in the world by a mile. Speculative bears are holding $US22 billion of Alibaba stock short, hoping to profit from a share decline, according to data compiled by financial analytics firm S3 Partners. That’s well over double the position in Tesla, the second most-shorted company worldwide. Alibaba’s soaring stock price has resulted in massive losses for these sceptics. They have taken a $US9.8 billion bath in 2017, a loss that’s more than twice the next-worst performing short. In fact, they lost $US2 billion last week as Alibaba climbed 10% on its blockbuster earnings report.